3December is an annual event celebrating 3D computer graphics. It was launched by Alias System Corporation. Currently, the event is coordinated by Autodesk, as Autodesk acquired Alias in December 2006. 3D computer graphics are graphics that use a three-dimensional representation of geometric data. The process of 3D graphics creation consists of three main phases: 3D modeling, layout and animation, and 3D rendering. 3December was created as a celebration of 3D computer graphics and the artists who create them. Originally, 3December was celebrated on December 3. 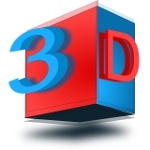 The date was chosen as an allusion to the abbreviation 3D. Currently, various events are held during the first week or decade of December. The events are hosted by Autodesk and partners, such as Intel, Wacom, Dell etc. They include virtual and live activities aimed at connecting 3D artists from around the world, giving them an opportunity to share experience. 3December events and activities typically include (but are not limited to) presentations, lectures, workshops, interviews, tutorials and more. Attendees are able to learn from top 3D artists and share their work. 3December is also a brilliant opportunity to network.